"A Research Framework for the Archaeology of the Extractive Industries in England (Mining and Quarrying)"
NAMHO has been involved with a project which will benefit mining history and help with the making of decisions about future archaeological research and the heritage of mining landscapes in England. The Research Framework was commissioned by, and jointly funded with, English Heritage (now Historic England), which enabled NAMHO groups and individual members to contribute towards and help influence research priorities. It provides guidance towards conservation and education strategies, and raises awareness of historic extractive industries as part of the wider heritage agenda. At its core is a coordinated effort to collate the results of previous archaeological research, which provide the information needed to achieve these wider aims. NAMHO members supported this phase of the project by helping with the supply of this information and by contributing to discussions at the series of regional seminars held in 2011 and 2012. The first task was to undertake a comprehensive review of existing archaeological data and to compile a series of assessments. Initially this involved exploring county historic environment records (HERs) and collating bibliographical sources. Also vital to the success of this project was the expertise and knowledge contributed by NAMHO members. Energy Minerals: coal, lignite etc. Bulk Minerals: building stone, aggregates, lime, sand, gravel etc. Other Industrial Minerals: evaporites, clays etc. Miscellaneous minerals: graphite, arsenic, talc, abrasives, pigments etc. The assessments represent the result of an extended period consultation with various specialists in each of the topics within our remit. In each case the task of writing the assessments was assigned to an individual with specialist knowledge, working in collaboration with others who have wished to contribute. The texts have been redrafted several times in the light of new information from various sources, then edited for approximate consistency of style. 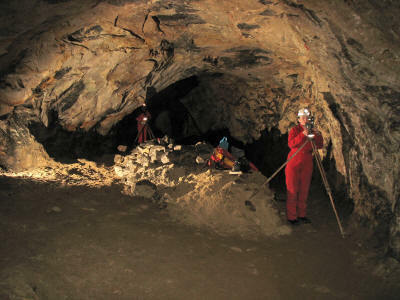 Archaeological material has been drawn from published and unpublished sources and a trawl of the Historic Environment Records in each of the English counties and National Parks. The final versions are thorough and authoritative appraisals, which expose the strengths and weaknesses in our current data, enabling us to inform future national archaeological research strategies in England. This Agenda has been compiled following completion of the assessment and sets out a broad range of research aims agreed through widespread consultation, including at two seminars held in 2012. It forms the basis for a Research Framework which will identify strategic priorities for future research and forms part of the final publication. 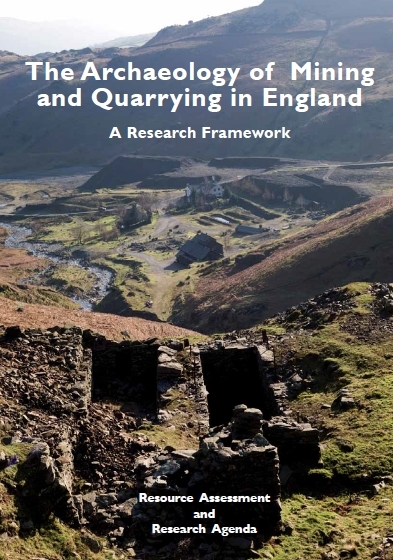 The first stage of the Research Framework for the Archaeology of the Extractive Industries in England has been completed with the publication of The Archaeology of Mining and Quarrying in England: A Research Framework. The document will be available in a high resolution form in due course but it can be downloaded here in two parts, each about 5MB, in PDF format. This presents the results of an in-depth assessment of available historical and archaeological resources for all minerals, from copper through to building stone, drawing primarily on expertise within the voluntary sector. It provides background information on the geology, applied technology and the historic impact on infrastructure such as transport and settlement. The potentials for further study are identified and presented as a Research Agenda, to be used to develop priorities for future investigation. It also provides information that will assist in forming conservation and research strategies; highlighting the significance of the extractive industries as a cultural resource. A seminar to launch that publication is planned for Sunday 24th April 2016 at the Lion Saltworks, near Northwich in Cheshire - please contact Dr Peter Claughton (P.F.Claughton@exeter.ac.uk) for details on booking. A limited number of books are available to individuals for personal use at £15 (plus postage at £3) - contact Peter Claughton - or it can be download free as a PDF (details below). Copies have been distributed to Historic Environment Records and other archaeological bodies across the country and all our constituent organisations have a copy. As stated above, this is only the first stage of the process. We now have to work towards the implementation of the aims set out in the Research Agenda. We also have to address the priorities required to aid us in that task. This, the Research Strategy, will be developed over the next few years.